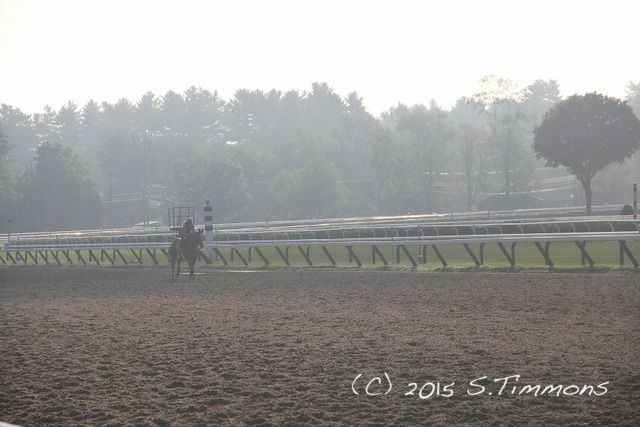 Thank you, Sally, for a what I thought would be a sneak preview of Saratoga - your pictures are wonderful. But, unfortunately, I canceled my reservations this a.m. for some health reasons. 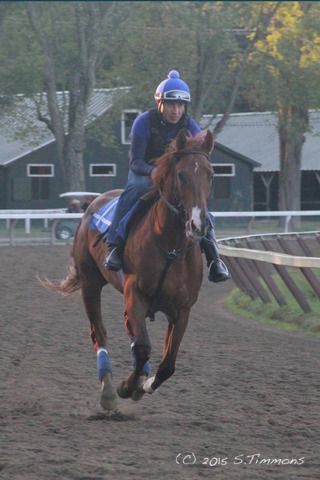 So, I'm counting on you to provide the ultimate experience of Saratoga for me. :-) I going to try for 2016! I'm sorry to hear that you're not coming. I hope everything works out for you health-wise. I'll do my best to keep you updated. But, I head back to school in 2 weeks-YIKES! I should be able to get quite a few visits in before then though. And I'm definitely going to the Traver's. So sorry that you are unwell, bigherbie. Best wishes to you. Oh dear. A ticket. Was it on the VT or NY side of the border? VT has a really absurd speed liimit. I got a ticket there driving on a 4-lane divided road going over the 50 mph speed limit. 50 mph is ridiculous. There was no traffic and it was around supper time. I was driving a rented car with Indiana plates, though. The poor cop was sure confused. Indiana plates from a car rental place in Boston, Massachusetts, and I had a California driver's license. So he threw the book at me. Ah. You had the out-of-state plates there. Bigherbie, I just saw your post. Sorry to hear of the health issues. Hope you are doing better now, or will be soon. Health issues are the pits, especially during vacation time. Bleah. Sorry you could not make it to track Bigherbie. :(,hope you feel better. 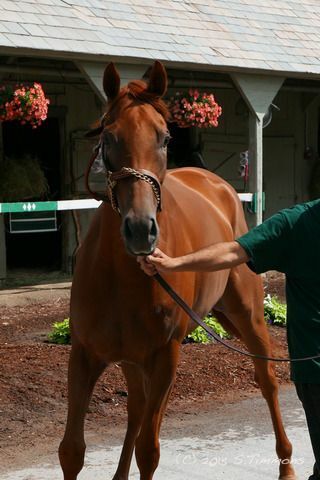 I agree with Zayat, too. Today I went to watch the trainings and then a barn talk by trainer Gary Contessa, about conformation. I headed over, and went to the OK track first. I don't usually go to the main track, because the sun makes photographing difficult. When things slowed down at the OK track, I decided to try the main track today. They prepare or groom the track twice each morning, so when the water trucks and tractors are at one, you can move over to the other, as they share the equipment. To try and explain what it's like, there are horses usually in groups (by trainer) coming out onto the track heading clockwise along the outside rail, getting ready to exercise. There are also individual horses & riders. The horses that are already exercising, are along the inner rail, running counter clockwise. I'm explaining this to set up my surprise..... The horses are coming & going from both directions, and you don't know who they are. You can see their saddle cloth as they go by, which is too late if you want a photo. So basically I'm taking a ton of "blind photos", not knowing who's who. At the main track it's more difficult, because the horses are coming at you with the sun behind them. This is an example of what you see when there aren't any horses crossing in front of you! I was about to head back to the OK track, and was photographing a horse going left in front of me, when at the last second, I caught a glimpse of Kevlan (Coz's exercise rider) passing behind the other horse in the opposite direction. I got a single shot. I knew that it wasn't Coz, but I didn't get a good look at the horse. I waited around hoping he would take another turn around the track, but didn't see him again. All I knew for sure, was that the horse was lighter than Coz, and possibly a chestnut....... I really didn't have high hopes, as I have plenty of photos from John's stable of horses whose identities I never figured out. When I got home and downloaded my pics, I'm thinking, well it could be Zi, but I don't know...... When I went to the photo section and looked at Zi's pics, I noticed the shapes of his socks- and I believe it IS Zi. Not positive but pretty sure. Do you folks concur? 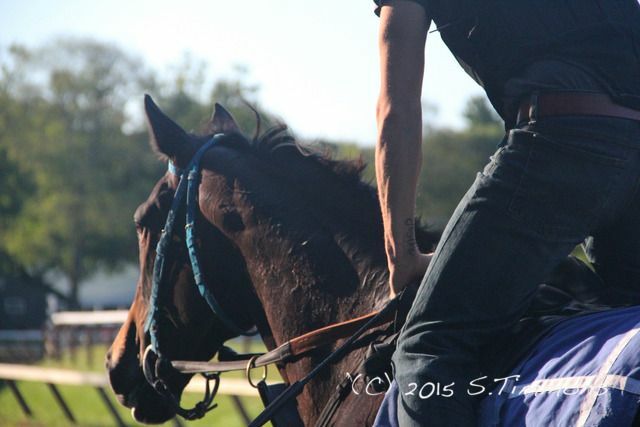 Last summer Coz trained at Clare Court and the OK track-all my photos of him were from the OK. If Zi is training on the main track, I'll have to get over there more often!! I need to experiment so I can find a better spot to photograph from on sunny days. SallyT --- awesome pictures --- you're really talented with a camera! What's your major at school, photo journalism? 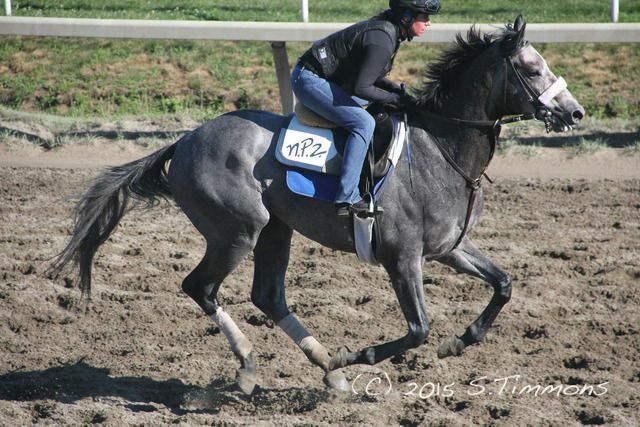 The pic of Zi is great ---he's such a beautiful colt. So glad you spotted Kevlan and had a "quick finger"! 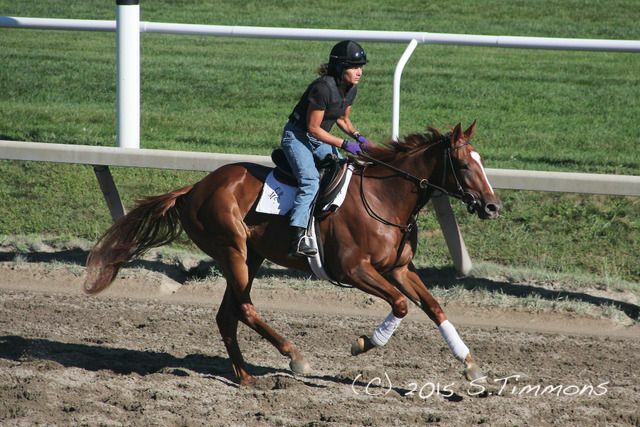 Hope you are able to get a few more shots of Z's "Chestnut Perfection" while you are at Saratoga. Gary Contessa’s barn talk yesterday was great! There ended up being about 30 of us attending, and we each got a conformation photo of American Pharaoh, and a magazine called “Equicurean” ( that has a feature on AP, written by the woman giving them out.) Gary was such a nice guy, very personable and down to earth. 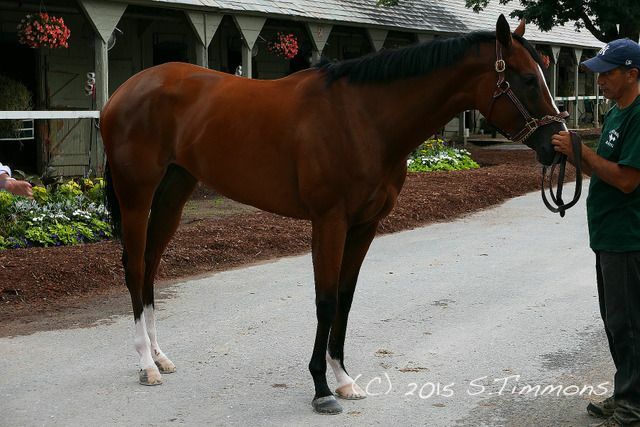 We were able to stroll in front of his barn for photos of some of the other horses before & after the talk. He brought out 4 horses to illustrate different conformation points. In addition to all the conformation explanations, he answered ALL kind of questions, ranging from a detailed description of laminitis, to what issues different conformation variations can create. He described running Uncle Sy in the Kentucky Derby this year, and the various types of therapies that the horses get every day after exercising. He also explained the different methods for vet checking internal conformation/health for sales, etc. He even answered the questions about the possibility of AP coming up for the Traver’s! (LOL) He trains horses for individuals (of course), but also has quite a number of "group owners". (can’t think of the term at the moment). 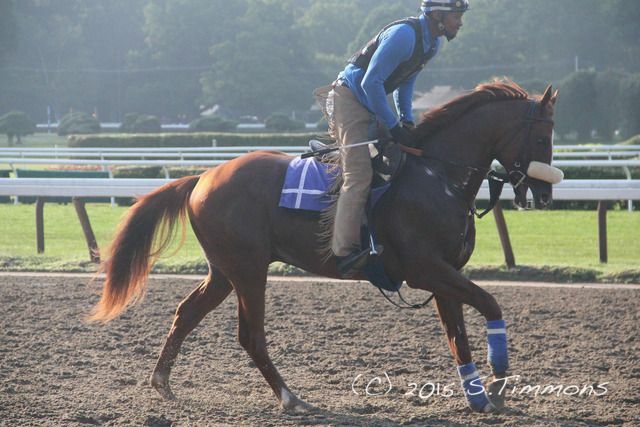 Gary told us that all the trainers are limited to 30 horses stabled at Saratoga at a time. So, for example, he has another fifty horses stabled at Belmont, and they’re constantly being shuffled in and out for their races. I knew that the trainers kept horses at Belmont & other private facilities in the area, but had no idea how limiting the barn space was for each trainer at the Spa! 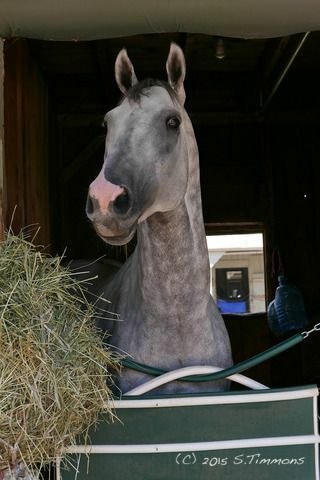 Uncle Sy ran in the derby this year, and is a permanent resident in the Saratoga barn-no shuffling off to Belmont for him! Before he was brought out as an example, the poor guy was trying to catch some zzzz's in his stall. I didn't get her name, but she was a real character! 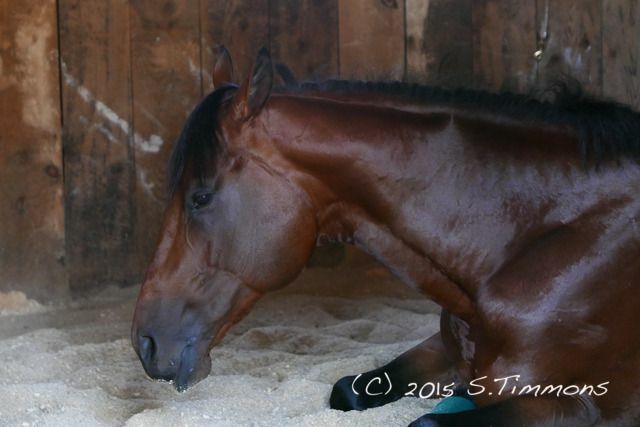 Wow, that barn talk by Gary Contessa must have been so wonderful and informative. What a stroke of good fortune to get in on that. The pictures are beautiful, as are the subjects. Thanks so much for sharing. Can't tell you how much I am enjoying your photos....amazing and wonderful. Thank you for sharing! I agree -- beautiful pics, SallyT! Thanks for taking the time to share with us! In advance of the Travers Day card, which features six Grade 1 races, NYRA announced that paid attendance for the Mid-Summer Derby will be capped at 50,000. General admission can be purchased now at Ticketmaster.com. c) he was at the other track. I'd been meaning to check out the new statue of Native Dancer that was installed last weekend in a new little park at the top of Union Ave., which is the main street that the track sits on. 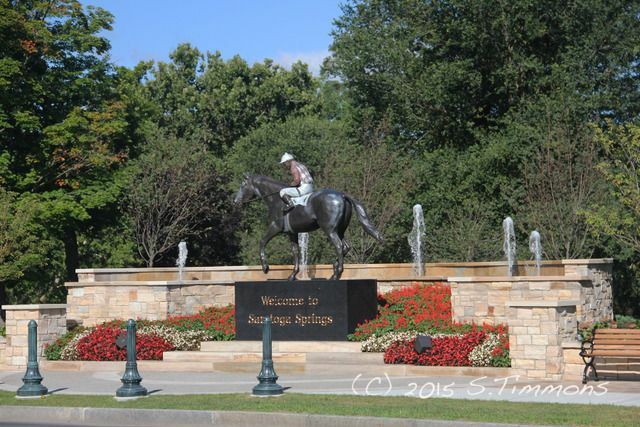 Marilou Whitney & her husband gave the statue & park to the City of Saratoga Springs for their Centennial Celebration. I guess they didn't incorporate or charter, (or however cities establish themselves) for a while, as the race course celebrated 150 years of racing in 2013. 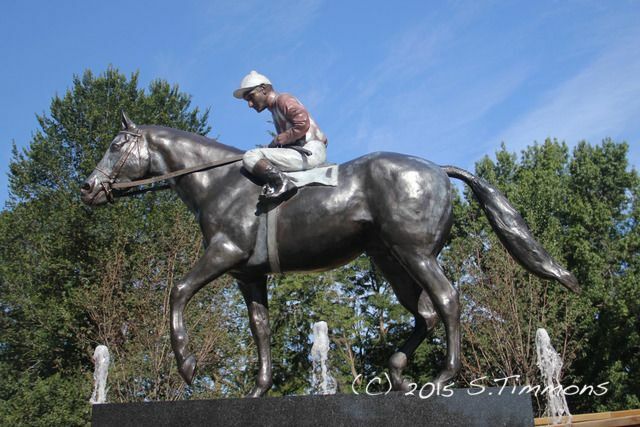 A Storm Cat statue was on loan from the Overbrook Farm in Lexington, Ky. for a couple of months until the custom statue of Native Dancer was completed by Gwen Reardon. Reardon who is 84 years old, broke her wrist recently and asked for extra time to complete the bronze sculpture. 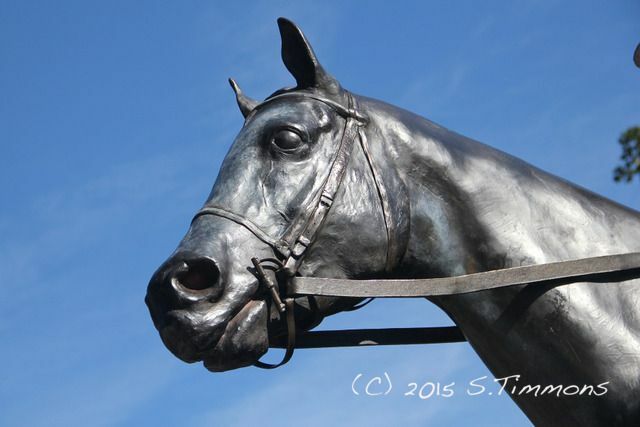 So here's Native Dancer recently installed in his new park.